Series 549 Hinged doors in aluminium and glass are ideal in any situation, from front doors to utility doors. They can be supplied in standard configurations or follow a more developed design approach. The door stiles and rails are substantial and strong, and come with many upgrade options – decorative glazing bars, choice of attractive hardware, hightlights, sidelights and adjacent windows in a range of configurations. The Vantage 549 framing has been designed as a alternative to the traditional 135mm x 38mm timber entry door framing. Frames can be delivered to site pre-painted and with door panels and hardware fitted. Series 549 comes with self draining sill on internal opening doors. Alternatively for those exposed locations we recommend the external swing splayed sill. Both internal and external swing doors fitted with sill section have been tested to Australian Standard AS2047 and will resist 200Pa water. Features extra wide top and bottom rails that give the door the chunky appearance of traditional timber designs. Rebated door stiles give a flush appearance when the two doors meet and provide superior weather protection – no unsightly applied rebates. Custom hinges wrap around the aluminium door stile improving the appearance. Frame is reinforced at hinge fixing points. 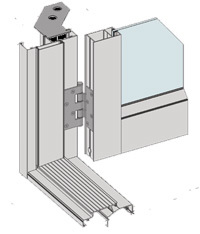 Doors can be fitted with custom parliament hinges where 180° opening is required. The perimeter frame has been designed with a dedicated screen door recess on the outer edge. This recess has a seal to soften the impact of metal on metal when the screen door closes. We can fit MAGNUM™ awning sashes into Series 549 framing. These awning sashes can be operated with manual or concealed electric winders or manual cam handles.